The jury is still out on whether a film based on an unsolved mystery that has captivated French media for over 30 years will be appreciated by audiences outside the Hexagon. This could be why André Téchiné’s L’Homme qu’on aimait trop, is less a run-of-the-mill crime thriller and more of a Greek tragedy. It’s a battle between mother and daughter complicated by the daughter’s lover. Allegedly motivated by financial gain, he is accused of her murder by her family although no body has ever been discovered. It’s an intriguing tale and one Téchiné directs with his usual talent for translating complicated stories to the big screen, but the film is hamstrung by its grounding in real events. It lacks the creative twists and turns needed to produce a taut thriller or the complex characters necessary for an engaging psychological drama . Most of the film is in flashback and revolves around the background to Renée Le Roux’s 30 year battle to bring to justice Maurice Agnelet, the man she suspects of murdering her daughter Agnès. Back in the 1970s, Le Roux (Catherine Deneuve) was head of the Palais de la Mediterranée, a Riviera-based casino which was at the centre of a turf war with the local mafia. Her daughter Agnès ( Adèle Haenel) has returned to France from Africa after a failed marriage and gradually falls in love with her mother’s business adviser, Agnelet (Guillaume Canet). Upset at being passed over for one of the top jobs at the casino, Agnelet persuades Agnes to vote against her mother at a crucial business meeting allowing local mafia boss Fratoni (Jean Corso) to take over the casino. In late November 1977, Agnès disappears without a trace and the Le Roux family points the finger of blame at Maurice. Téchiné has variously described L’Homme qu’on aimait trop as a ‘war film’ with the focus on the conflict between the three main characters and a ‘fairy tale’ complete with wicked queen, princess and handsome suitor. Neither description really hits the spot. It is also the story of a mother’s love for her child, a study of a gradual descent into madness and the tale of a man trying to prove his innocence. Téchiné doesn’t take sides recognising there’s nothing black and white about any of the characters. Agnelet is a cold -hearted womaniser seeking a place at a level in society where he does not naturally belong, but he is straight with Agnès about his feelings and he has a warm, loving relationship with his young son. Renée is a hard-headed businesswoman who is reluctant to give up her status at the prestigious casino, but she is genuinely confused by her daughter’s betrayal and spends the latter half of her life, and all her personal wealth, trying to unravel the mystery of her disappearance. And although Agnès is fragile and easily-led, she willingly goes along with Agnelet’s plan in exchange for getting her hands on a large sum of money. 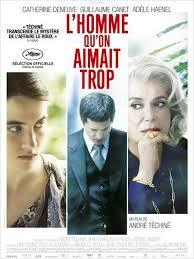 This is Deneuve’s seventh collaboration with Téchiné and she gives a solid, if somewhat flat, performance as Renée. Haenel does her best with the limited role and stilted dialogue she has been handed. But Canet shines and is highly convincing as the caddish Agnelet effortlessly suggesting the malice and naked ambition which lie just beneath his easy going charm.